Whether you're looking to relax among breathtaking mountain scenery or fill your vacation with exciting outdoor activities, Grass Valley is the perfect destination for you! With 3 bedrooms, 2 bathrooms, and enough room to comfortably accommodate 6 to 8 guests, this inviting residence is ideal for families or a group of close friends seeking an escape from everyday life. Nestled in the pleasant, ideally located Alta Sierra neighborhood, this vacation rental cabin ensures the ultimate getaway! This Tahoe-style log cabin sits just below 2,200 feet in elevation, offering stunning views of the Sierra Nevadas. While you'll have easy access to exciting attractions via Highway 49, you'll feel like you're a world away from the hustle and bustle of city life, as this home is very secluded from the closest neighbors. You and your companions will have plenty of room to spread out and unwind in the cabin's spacious living room, featuring a stone fireplace, cozy furnishings, and a flat screen TV with SLING TV. After an eventful day in the great outdoors, prepare a tasty home-cooked meal in the open kitchen, fully equipped with all the necessary appliances and cooking tools. The back deck will serve as the ideal place to spend warm evenings enjoy al fresco meals with beautiful views of a rock outcropping and flat park-like expanse. Other amenities provided for your comfort and convenience include wireless internet access and in-unit laundry machines. 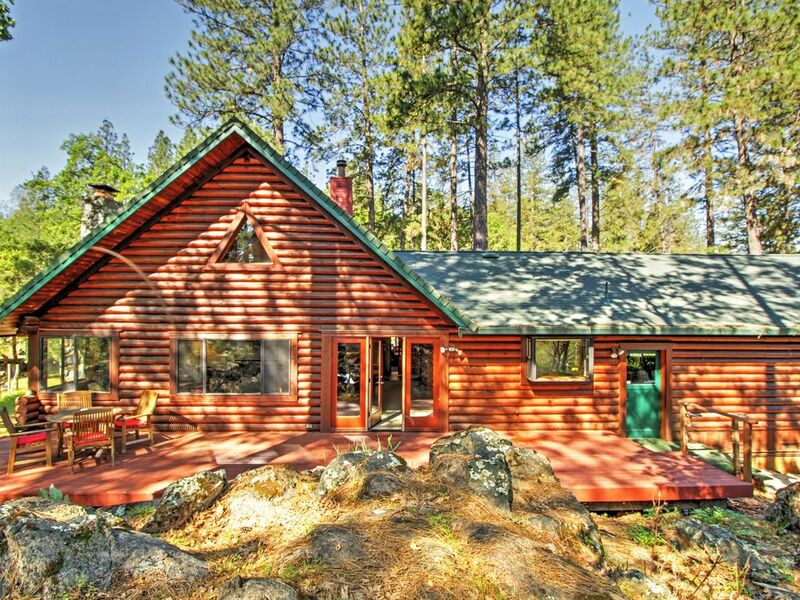 You won't have to venture far from this cabin to experience all the area has to offer! From here, you'll be 15 minutes away from downtown Grass Valley and Nevada City, where you can enjoy historic sites, live entertainment, restaurants, and shopping. Spend the day outdoors, exploring the Yuba River, hiking, bird watching, or mountain biking. The golfers in your group will delight in the property's easy access to the Alta Sierra Country Club, situated just 3 miles away. San Francisco, Sacramento, and Truckee are also within easy reach of the cabin, so you certainly won't run out of things to see and do! - Great Grass Valley location - Easy access to attractions in Nevada City, Sacramento, San Francisco, and Truckee! This was a perfect spot for our spring retreat! Thanks for creating such a serene and welcoming environment. We had a great weekend in this cute cabin! The driveway honestly isn't that steep despite intimidating reviews. The wood burning fireplace was a real plus and we appreciated how clean and spacious the cabin was. Hosts even left us a welcome basket--thanks!! This cabin was perfect for our wedding weekend! The first night, my bridesmaids and I stayed there, then just my husband and I the rest of the weekend. Very spacious and cozy! Love the outdoor seating area! So relaxing! Would definitely recommend this place to others. Few glitches that were worked out. Owner was very responsive. Evolve/Home Away needs to have a better system to solve problems, as they work with the property manager (who we never connected with). We Loved the open kitchen/living area. House is well maintained and very clean. Outdoor space is very relaxing. Driveway is very very steep - I would not rent this house in the winter time - even with my all wheel drive vehicle.